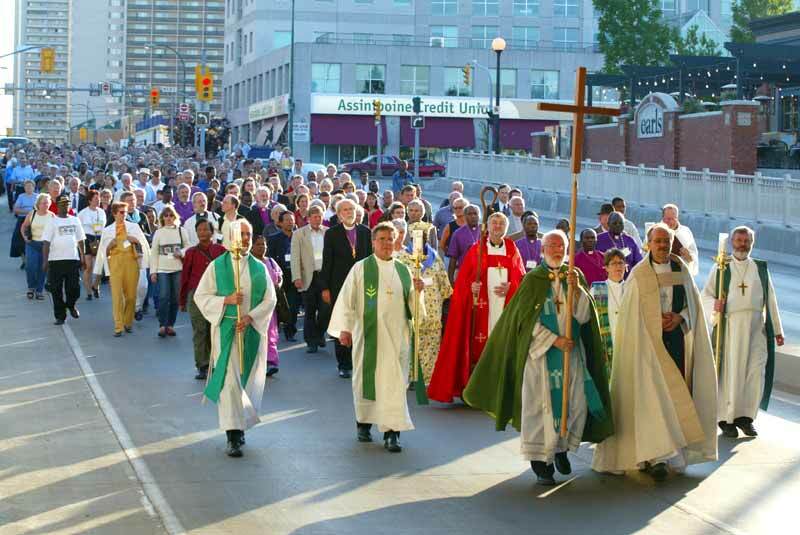 In silent and solemn procession, delegates and other participants in the Tenth Assembly of the Lutheran World Federation (LWF) walked from the Winnipeg Convention Centre through the streets of Winnipeg to the Oodena Circle at The Forks to protest the Canadian government’s refusal to grant visas to 53 of their fellow delegates from developing nations. Canadian First Nations representatives present the concerns of aboriginal and other indigenous peoples. 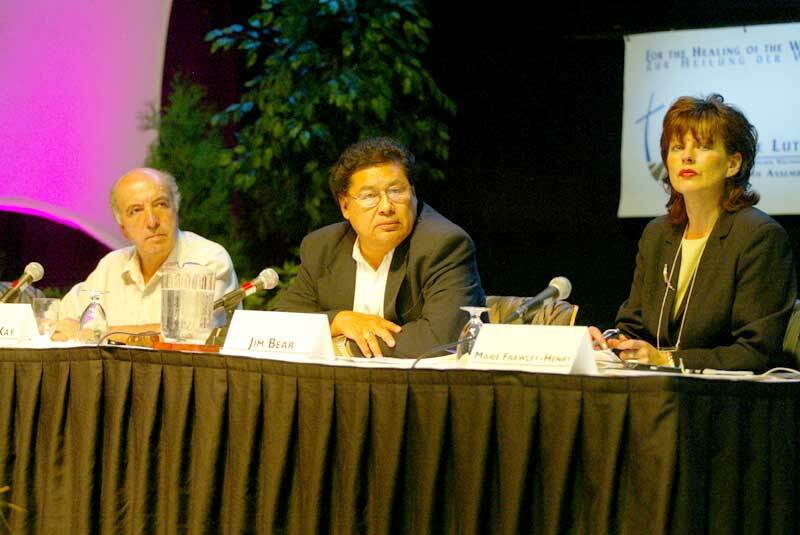 Shown from left: Stan McKay, aboriginal pastor and former moderator of the United Church of Canada; Jim Bear of the Manitoba Assembly of Chiefs; and Marie Frawley-Henry, representing the Assembly of First Nations. 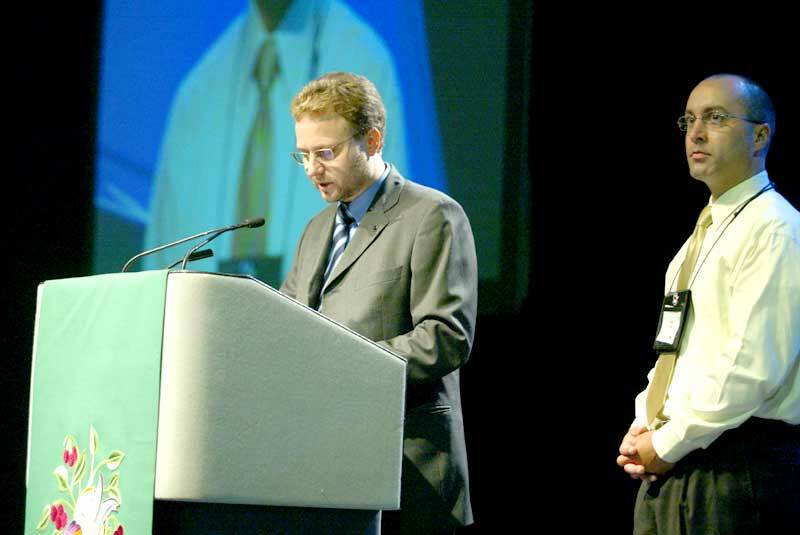 Dirk-Michael Grötzsch (left), Lutheran World Information (LWI) German language editor, and Rex Paisley, Web manager of the Evangelical Lutheran Church in America, report on Web usage for the four Assembly Web sites in English, German, French and Spanish. Thousands of people are following Assembly happenings via the Web site. 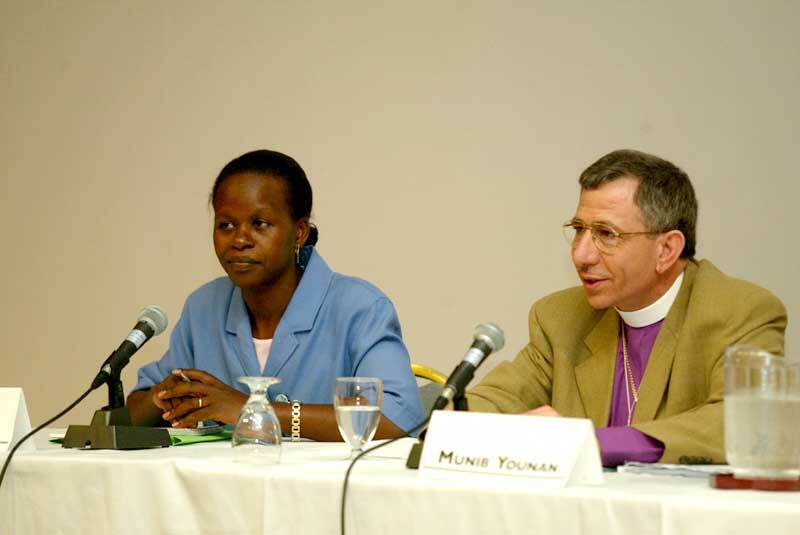 In a press briefing, Bishop Dr Munib A. Younan of the Evangelical Lutheran Church in Jordan (ELCJ) declared that the "Roadmap to Peace" is a "golden opportunity" to solve the enormous problems in his troubled region of the Middle East. "The gospel of healing is a total body experience" – that has been the inescapable message of the last 24 hours! Healing, Word and Sacrament, the study of scripture – among the basic food groups of the Christian life – were brought to life by the delegates from African churches at last night’s healing service and this morning’s eucharist and Bible study. 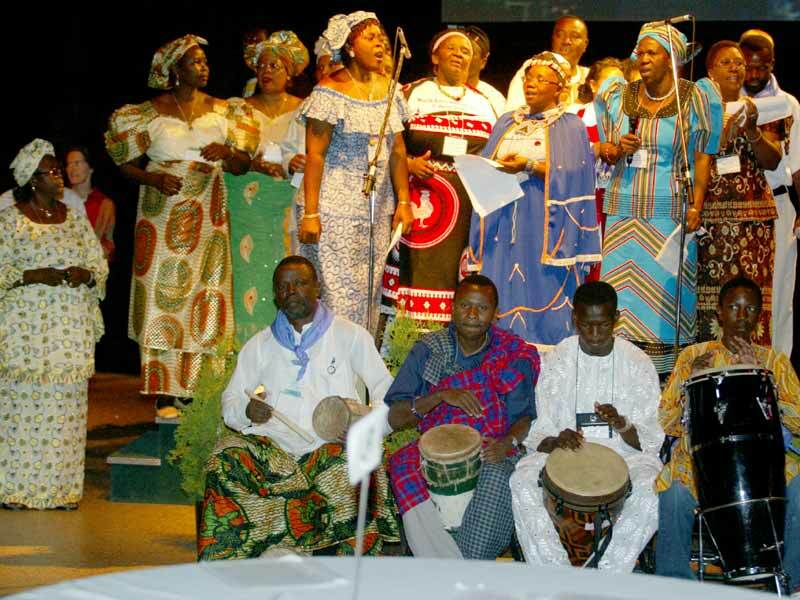 Based on Micah 6:1-8 and Luke 1:46-55 (Mary’s "Magnificat"), the theme "Rectify injustices" became a cry of the heart from delegates against the war, poverty and disease ravaging many African countries. The actors’ colorful native dress, dramatic presentation and pulsating music animated the Assembly plenary hall and filled the air with their message: the lowly shall be lifted up and the mighty cast down, in remembrance of God’s mercy. 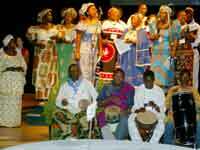 The audience was infected with the passionate rhythms of the message and music, and joined in the dance.